By Skyhawk to Florida – Day 1 – Ithaca to Oshkosh – EHFC Members Talking! Finally, after waiting all week for the weather to clear, the weather this morning was at least MVFR in Ithaca, with ceilings getting higher as I headed west. For once, everything worked right! 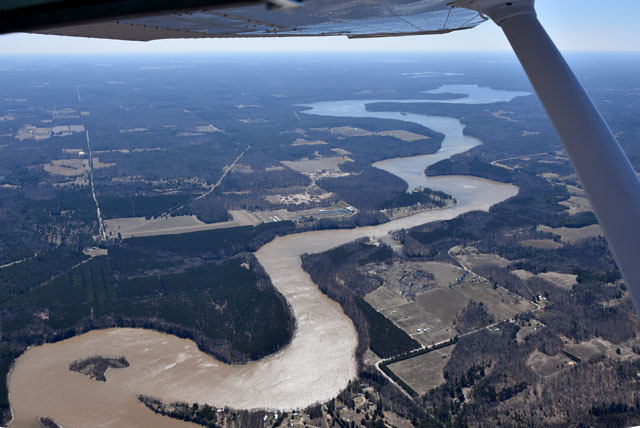 I filed a flight plan, took off on time, landed on time, closed the… all right, let’s not talk about that… took off again, crossed a lake, and landed again – all as I’d planned months ago. That’s got to be a first for me. Anyway, at eight-thirty this morning, the ceiling at Ithaca was 2,000 and clear under, so I hopped in 46493 and took off, heading west. By Geneseo I was comfortably above 2,500 feet, and basically stayed around that altitude for the entire leg as the ceiling rose above me. There was a large headwind – 25kt or more – and it’s usually best to stay low in those circumstances. My ground speed for the first few hours was in the low 80kt range, rising into the mid-90kt range over time. 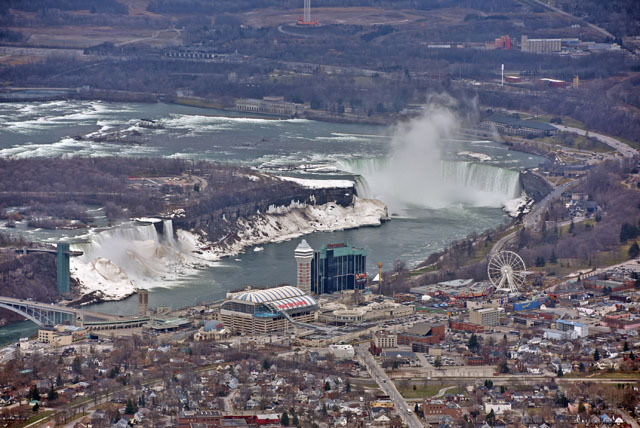 In time, I passed by Niagara Falls. You could see the mist rising from miles away, and even from outside the restricted area the falls were impressive. 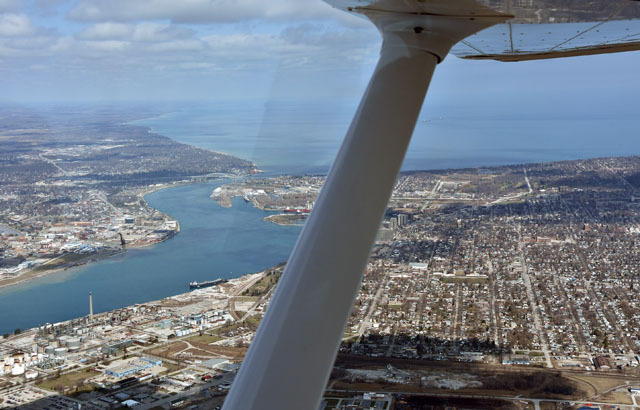 As I passed north of Niagara, I entered Canadian airspace, and was handed off to the St. Catherine’s controller. In case you haven’t done it before, overflying Canada is not a big deal. You just have to be on a flight plan and assigned a transponder code before you enter Canada, and then you just go. No need to deal with e-APIS or customs notifications or anything like that, as long as you don’t land in Canada. This was my first time dealing with Canadian Air Traffic Control, and it was interesting. They must be the politest controllers I’ve ever spoken to, for one thing. For another, the terminology is just slightly “off” for ears used to decades of FAA-speak. I got used to it, but you have to listen carefully at first. The other interesting thing about Canadian ATC is that the enroute controller handed me off to the tower of every airport I passed by (or switched me to the CTAF at untowered airports), then picked me up again on the other side. That took some getting used to, as well. The last Canadian controller I talked to signed out with “good luck – at that speed it’s going to take you a long time to get to Wichita!” “It beats walking”, I said, and he agreed. After an hour or so, the St. Clair River and Lake Huron appeared at Fort Huron / Port Edward, and I was back in the USA. My route entered the US at St. Clair (KPHN), and then it wasn’t too long before I was on the ground at Owasso Community Airport (KRNP). Owasso is a nice uncontrolled field with two turf runways and a longer asphalt runway 11/29. There’s a self-service fuel pump outside the airport office, and a small, but very friendly, cafe which serves quite tasty omelets. 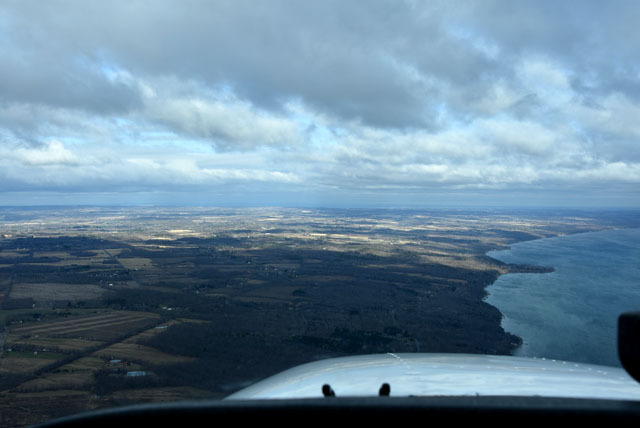 About 45 minutes out from Owasso, I’d climbed up to 4,500 feet so as to have a little more air under the wings as we crossed Lake Michigan. 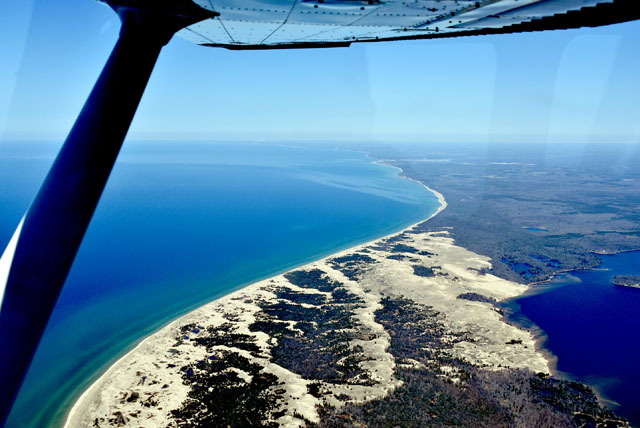 The Nordhouse Dunes stretch northward of Big Sable Point, and that’s the point where I turned westward to cross the Lake just north of the restricted zones. 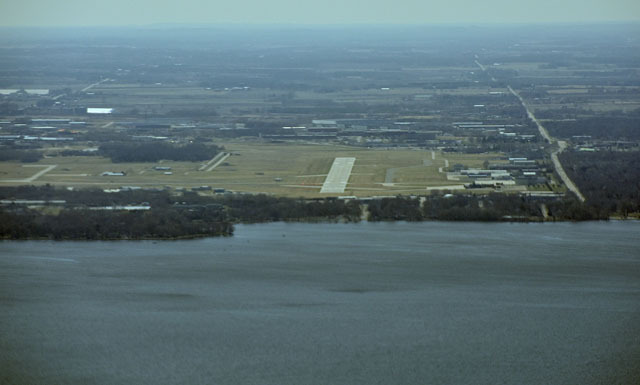 Forty miles further along, and I was on a two-mile final for runway 27, Oshkosh (KOSH). In investigating places to stay in Oshkosh, I found that the Hilton Garden Inn had a picture on their website showing airplanes parked outside. I’d called them, and sure enough they had their own private ramp for guests. How could I pass that up? When I landed I told the controller that I was going to the Hilton, and he said “taxiway Bravo, turn left on Bravo 3”, and I was there. 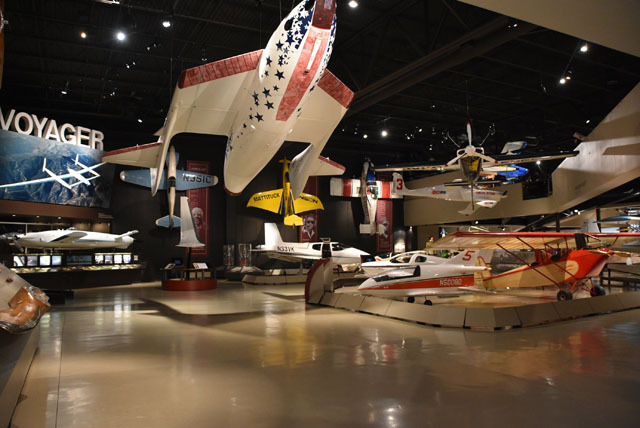 I checked in as quickly as I could, and walked the mile or so to the EAA Museum across the airport. I had an hour to spend there, and it was great. Having been to KOSH so many times during Airventure, I would love to just taxi in and park at the hotel ramp. I have heard rumors the rooms are reserved during “showtime” for the next 20 years. Nicely played Mike, glad you are making headway west! Great start to an adventure story! I can’t wait for the next chapter.